Researchers from Harvard and University College London conducted a two-week experiment that found cooks value appreciation most of all. 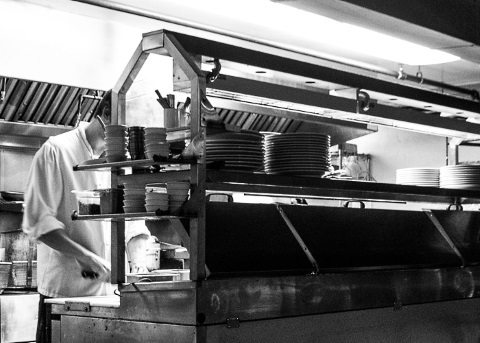 How often do you get to watch your food being cooked when you go out to eat? Sushi restaurants routinely put their sushi chefs out in full view, and any restaurant with an open-plan kitchen invites diners to see exactly the kind of effort that goes into cooking and plating their food. But in a lot of restaurants, there’s both a literal and a figurative wall between the cooks and the diners. That’s why researchers at Harvard Business School and University College London devised a two-week experiment to test one thing: do cooks make better food when they can see their diners? To run this experiment, the research team set up four different scenarios in a live cafeteria to chart progress over the two weeks. Group one: diners and cooks couldn’t see each other. Group two: only the diners could see the cooks. Group three: only the cooks could see the diners. Group four: both cooks and diners could see each other. The research team used iPads and videoconferencing software to enable cooks and diners to see one another, but not actually interact in any way. After two weeks, the results were clear: customer satisfaction rose 10% in the scenario where the cooks could see the diners. Researchers also noted no improvement in customer satisfaction with the status quo scenario, where neither diners nor cooks could see each other. But in the group where both diners and customers were visible to one another, two things happened: customer satisfaction rose a whopping 17.3%. Also, service was 13.2% faster. “We’ve learned that seeing the customer can make employees feel more appreciated, more satisfied with their jobs, and more willing to exert effort. “We considered whether transparency could have unintended costs. We found that reciprocity plays a much bigger role than stress or accountability. This is more about gratitude—which is a powerful force. Just in time for Thanksgiving, these researchers have proved that gratitude really does make a difference. Think about that when you’re prepping for the big food-coma holiday.